2016 was a year when I decided to tick another place off my bucket list. I initially had grand plans of heading over to Western Australia, but by the time I started some serious planning, I realised I only had two weeks of leave available, so I had to reconsider my options and find somewhere that wasn’t more than a couple of days’ drive away. One thing I knew was that I had to head west from Melbourne and at least cross the border into South Australia. 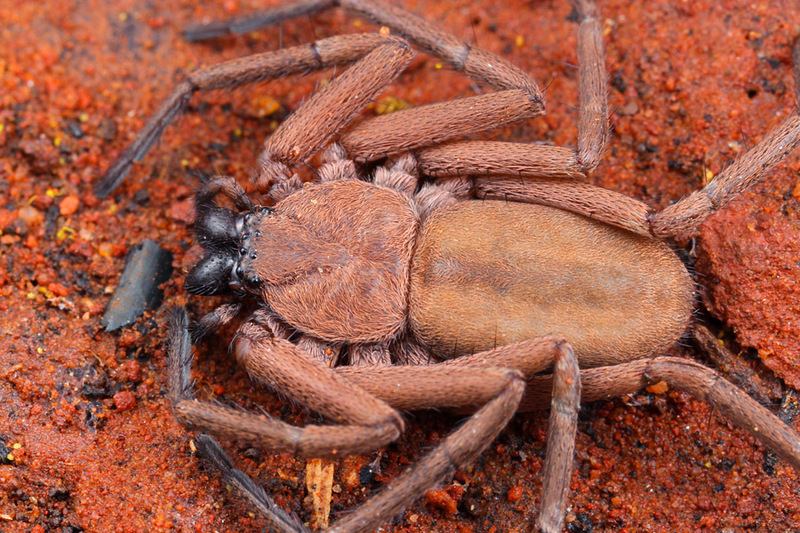 After all, if I’m going to have a website that claims to be about AUSTRALIA’s invertebrate wildlife, I better make sure I cover more than just the eastern states. The Flinders Ranges ticked all the boxes. 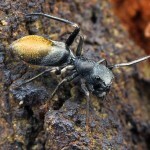 It’s in South Australia, it’s approximately 1,200 kilometers northwest of Melbourne, an easy 2-day drive, it has some of the most amazing sights you could ever hope to see and it has an abundance of wildflowers at the right time of the year, which I was hoping would equate to an abundance of insects and other creatures. Oh, and it has accommodation right in the heart of the park. Booking everything and getting there was the easy part. The challenge, as it turned out, was going to be the weather. I left home on the 24th of September and spent the first day driving up to Mildura in Victoria’s north-west and then heading due west to Renmark, which is just over the South Australian border. It was a chilly, damp day, but I was hopeful that the forecast was true and that the next few days would be ok. I made a couple of short stops along the way, and although there were a number of native plants in full bloom, the cold wind and constant drizzle made the insects pretty scarce, but I managed to spot a few. The next morning I continued on, following the Goyder Highway out through the town of Burra and then heading north along the Barrier Highway. I then cut across through Peterborough and got onto R.M. 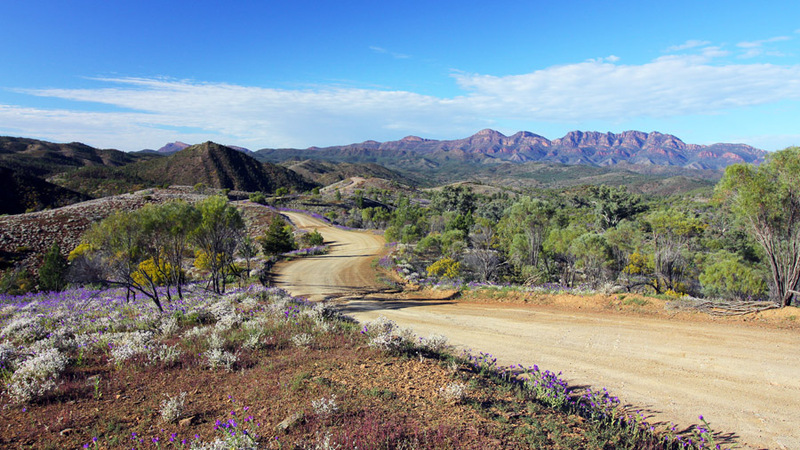 Williams Way and finally Flinders Ranges Way, which took me to the national park and Wilpena Pound Resort, my home for the next five nights. The entire journey was a pleasant one and I stopped a few times to take photos of some of the abandoned sandstone homesteads that were scattered here and there in the fields. They were constructed during the 1800’s by some of the early pioneer families seeking their fortune in wheat and sheep farming, but not everyone coped with the conditions, especially when the rainfall was considerably less than they expected. I, however, had arrived during a period of unseasonably high rainfall, so I was presented with crumbling ruins surrounded by lush green pastures. 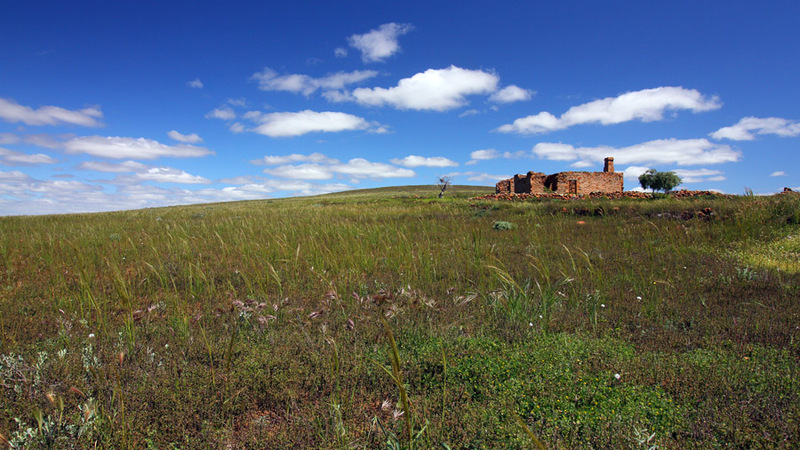 An old homestead succumbing to the ravages of time in the rural district of Kanyaka, South Australia. The best part of the drive was when I first saw the majestic rocky escarpments rising up from the plains, surrounding Wilpena Pound like the walls of a giant fortress. At last, I had arrived at the doorstep of an ancient wonderland and I was very excited at the prospect of what lay ahead when I started exploring this stunning place, but that would have to wait until the next day. Being late in the afternoon by the time I arrived at Wilpena Pound Resort and got settled in, I only had a brief opportunity to go for a stroll before meeting up with one of my work colleagues and his family for a meal and a chat around their campfire at the caravan park. After a pleasant evening, I was ready for a well-earned rest. Tomorrow the adventure would begin in earnest. The next few days were spent driving and walking in as many places as I could. The first morning was spent driving along Bunyeroo Road, stopping frequently to stand in awe of some of the prettiest views I have ever seen. The image at the top of this post is from that first morning and I could have sat at that spot all day. I don’t have the words to describe how I felt at the time, so I hope the photo gets the message across. This was as far as I went along the road because I wasn’t sure how my car would handle some of the ruts and creek crossings that lay ahead, especially since there had been so much rain lately, so I went back to Wilpena Pound and spent the afternoon walking to Wangarra Lookout, which offers some spectacular views over the “pound”. The view from Wangarra Lookout. The following day was the most “adventurous”. 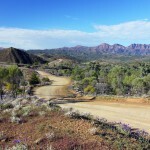 I decided to test my car’s all-wheel drive capabilities and took to the “road” that winds through Brachina Gorge and connects with the highway that heads to the town of Parachilna. Fortunately, there hadn’t been any rain for a few days, so the pebble-lined creek that flowed through the gorge wasn’t too deep, so my car handled the conditions with ease. It was an extraordinary drive through 130 million years of geological history and around every bend was a magical scene to rival the previous one. Needless to say I took a lot of photos that day, but surprisingly, I didn’t photograph a single insect, not that I’m complaining. 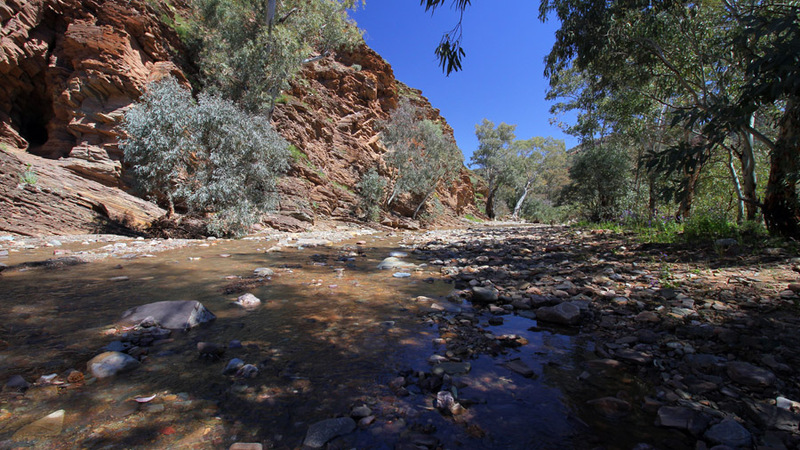 The first of many creek crossings in Brachina Gorge. Determined to find a few insects, I got up early the next day and headed south to a walking track that leads to Arkaroo Rock, a small rock shelter that is adorned with ochre and charcoal artwork drawn by the region’s first inhabitants, the Adnyamathanha people. 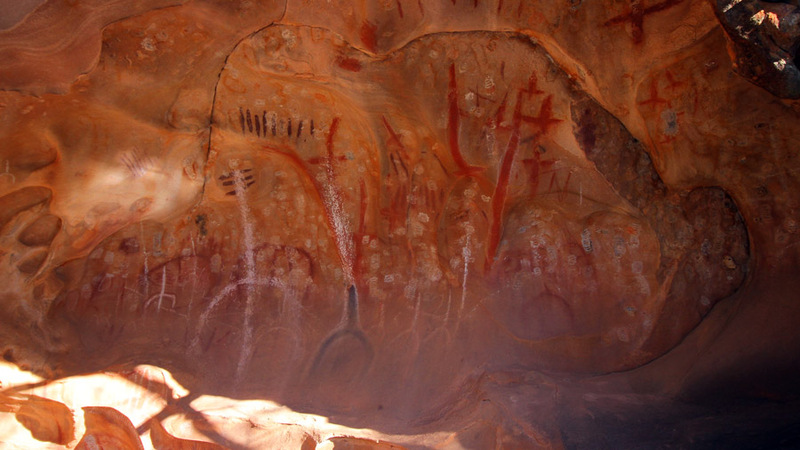 The paintings, which are possibly thousands of years old, tell the Dreaming story of the creation of Ikara (Wilpena Pound). The story goes that two giant serpents (Akurra) surrounded a hunting party who were about to hold a ceremony, but after a fierce battle, the hunters killed the serpents and their bodies petrified to form the walls of Ikara. A fascinating story that echoes down through the years through these paintings. Arkaroo Rock. The paintings are so well preserved, they look like they could have been done yesterday. All along the track there were a number of plants in flower and this was the warmest day so far, so I felt confident that I would find a few creatures, which I managed to do. I photographed a few different beetles, ants and spiders, but it wasn’t long before a change rolled in and I was forced to retreat when it started to rain. I headed back to my accommodation disappointed, but the weather cleared again a short time later, so I went back to the track and resumed the hunt. Unfortunately, the sunshine wasn’t going to last long because there was even worse weather predicted, so I put every effort into finding as much as I could before things really turned sour and a thunderstorm developed. Sadly, that was as good as it got. The following day was a complete write-off thanks to 24 hours of non-stop rain. I tried to be brave and went out to get a few scenic shots, but my enthusiasm didn’t last long, so I spent most of the day working on identifications for some of the creatures I had found in the preceding days. My time in the Flinders Ranges came to an end the next day and I departed and headed off to Nhill in western Victoria for another few days of exploration around Little Desert National Park and Big Desert Wilderness Area. 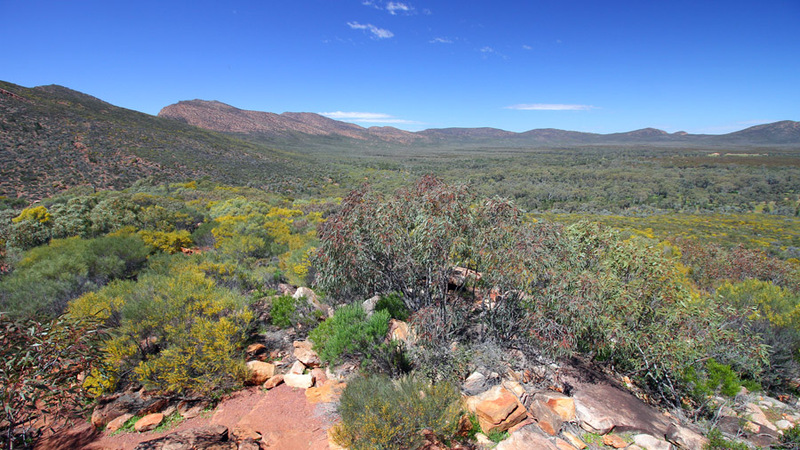 Despite the fickle weather, I thoroughly enjoyed my first photographic foray into South Australia and there is little doubt that I will be going back to Flinders Ranges National Park again. 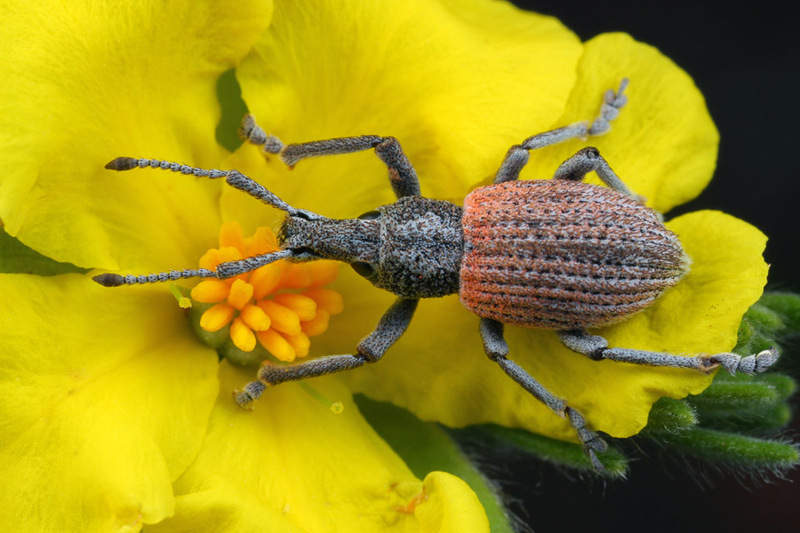 A weevil, possibly a Leptopius sp., taking a break on a Hibbertia flower. 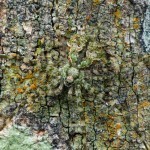 This rather flat spider, perhaps a member of the family Trochanteriidae, is the perfect shape for hiding under rocks and bark. 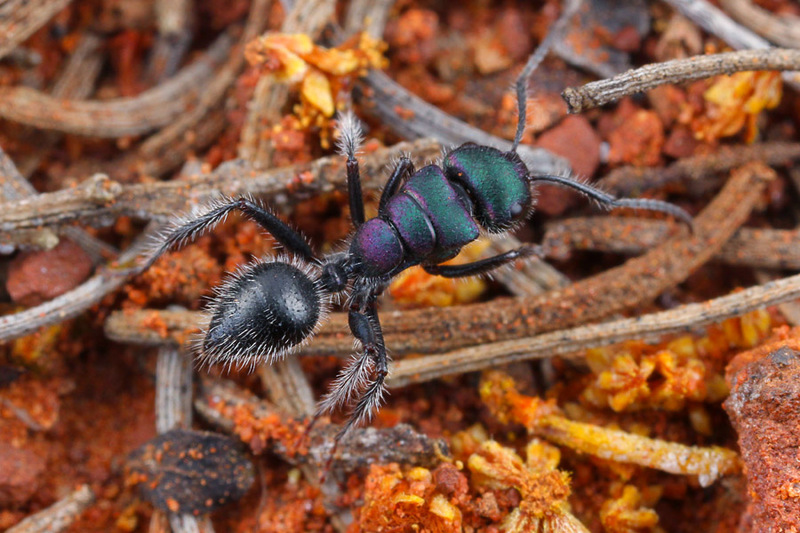 Calomyrmex splendidus, a pretty little ant from the subfamily Formicinae. 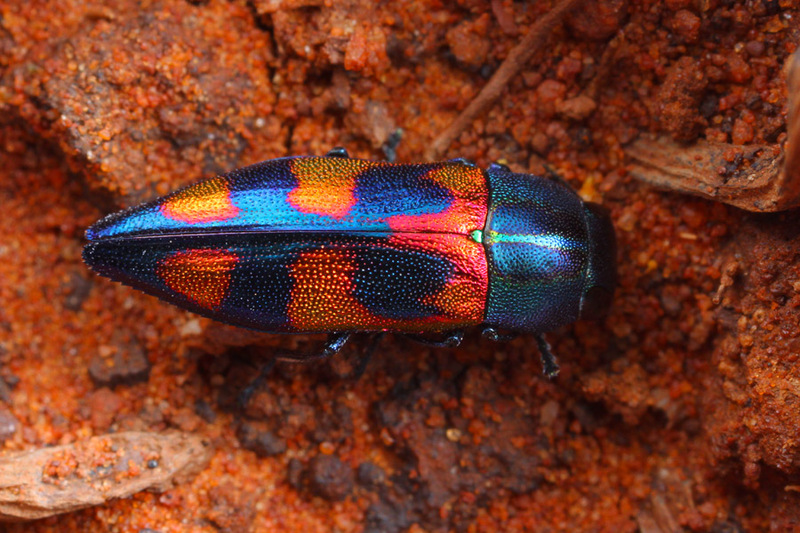 The only jewel beetle (Buprestidae) that I found during the entire trip, but what a beauty! Melobasis gratiosissima speciosa. 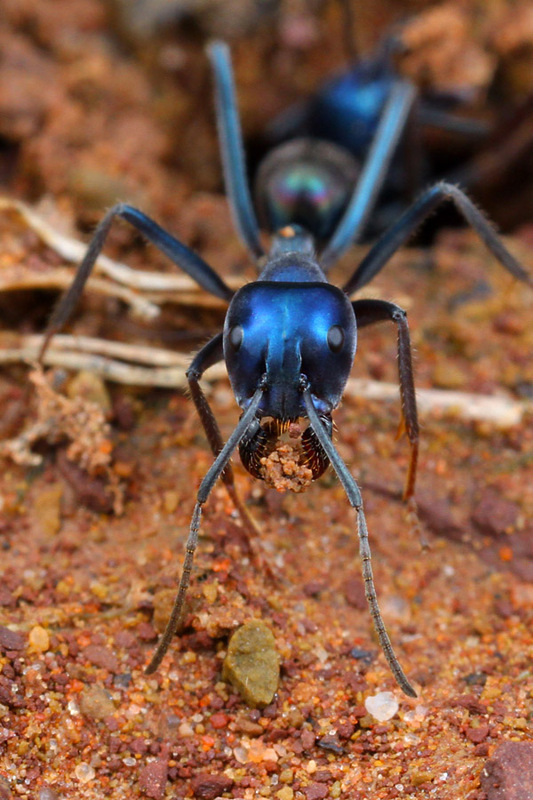 The lustrous royal blue of this Iridomyrmex lividus (subfamily Dolichoderinae) certainly makes it stand out in the ant world. Do you have a question or comment? You’re welcome to get in touch with me through the CONTACT PAGE.